Hynice Magnetic Detachable 9card Holder Wallet Case for iPhone XS/ X only. Feature: 1.Made of durable, environmental-friendly PU leather, looked elegant, touched comfortable. 2.Flip Wallet:with 9 card slots(include 1PC photo slot) and 3PC cash pocket. 3.Detachable Magnetic Shock-absorption back cover. 4.Hand wristlet strap makes it easy to carry around. 5.Precise cutouts give you full access to all ports and buttons. 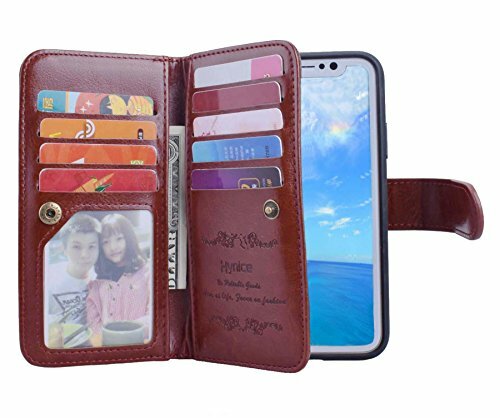 Package: 1PC wallet case for iPhone XS/X About Hynice Hynice is a US/UK registered Trademark, all Hynice products are sold exclusively by haoyuan Boundless(US);haoyuan(UK). Unauthorized selling of Hynice products will hold responsibility of trademark infringement.